President Donald Trump has talked a great deal about infrastructure investment. For months, his administration has signaled its intention to release a plan for spending $200 billion on infrastructure over 10 years.1 Importantly, the new plan—when it eventually arrives—cannot and should not be assessed in isolation from the president’s fiscal year 2018 budget, as it is the combination of the two that provides the full picture of the administration’s vision for infrastructure policy. Unfortunately, President Trump’s vision for infrastructure involves deep cuts to core programs. 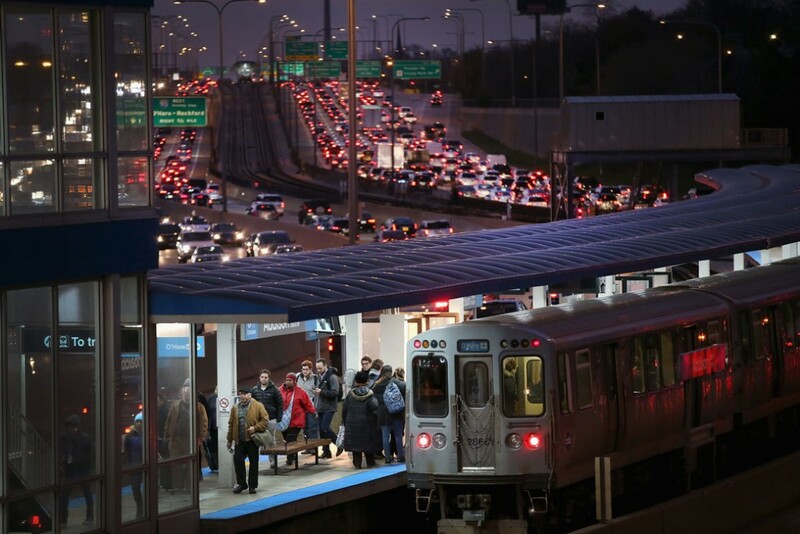 The biggest and most harmful cut would be to the Highway Trust Fund (HTF), which provides funding for thousands of highway and public transportation projects each year. This money is the foundation upon which states and regions build their infrastructure programs. The president’s FY 2018 budget calls for “Highway Trust Fund outlays [to] conform to baseline levels of Highway Trust Fund revenues.”2 This is budgetary speak for a massive cut to the HTF. The HTF is principally capitalized by an 18.4 cent a gallon tax on gasoline and a 24.4 cent a gallon tax on diesel.3 For years, Congress has authorized the HTF to provide states and regions with more money than it collects in federal gasoline and diesel taxes.4 To cover the shortfall, Congress has repeatedly transferred Treasury general fund revenues into the HTF.5 The Trump administration would like these transfers to stop. According to the Congressional Budget Office, the HTF will become insolvent at the end of FY 2020.6 Between FY 2021 and FY 2027, the trust fund is projected to have a shortfall of $138 billion. In other words, if trust fund outlays must match gas tax receipts, then state and local governments will face a cut of $138 billion in the coming years. In addition, the administration would like to offset their infrastructure plan by cutting $200 billion from nondefense discretionary programs. This would include the elimination of critical infrastructure programs like Transportation Investment Generating Economic Recovery (TIGER), New Starts, and Amtrak long-distance routes, among others.7 During a recent interview with The Wall Street Journal, the president reiterated his desire to offset the infrastructure plan with cuts to domestic programs like the ones referenced in the budget. When asked if the plan would be deficit-financed or covered by new revenues, he responded: “No. This will be—this will be money that we will find.”8 Altogether, President Trump wants to cut at least $338 billion, or $1.69 for every $1 of proposed expenditure. The net effect would be a reduction in total employment. 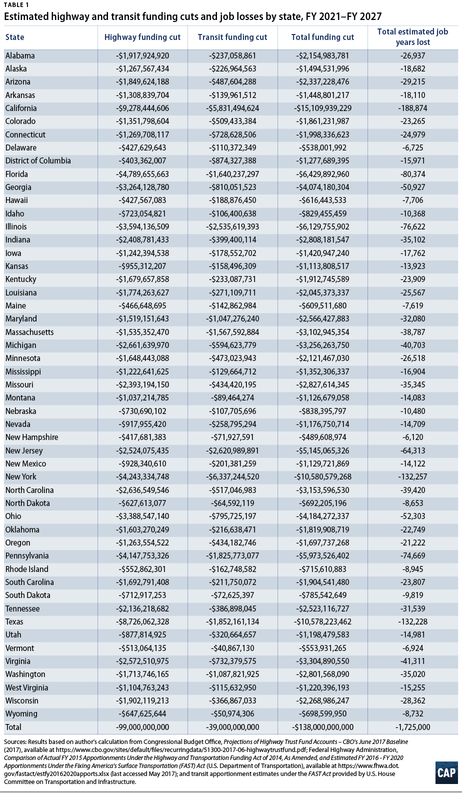 The following table estimates the $138 billion funding cut for both highway and transit programs by state, as well as potential job losses. The cuts proposed by the Trump administration are unacceptable. The time has come for national infrastructure investment that is robust, comprehensive, equitable, sustainable, and targeted. This means that the federal government should spend at least $1 trillion above baseline over the next 10 years. These outlays should support everything from highways, public transportation, and aviation to affordable housing, water, clean energy, child care facilities, and rural broadband, among other sectors. Furthermore, these investments should provide people with safe, affordable, and reliable access to opportunity and, wherever possible, redress the harms created by past infrastructure investments. Federal funds should promote sustainability by protecting local communities and natural habitats and by ensuring that the United States meets its climate commitments. Finally, federal funds should be targeted to those communities facing the greatest need. Taken together, these five principles will ensure that federal funds produce the greatest return on investment and create an economy that works for everyone, not just the wealthy few.